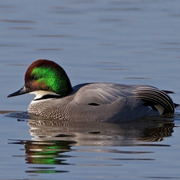 Once known as the Falcated Teal, this East Asian native is about the size of the Gadwall and the American Wigeon, but with a heavier-bodied, larger-headed appearance. The spectacular male has an iridescent green- and coppery-toned head, white throat, mostly gray body, and long, sickle-shaped tertial feathers curving downward over the rump and tail. The female is similar to the female wigeon, but plainer, with a black bill. The Falcated Duck breeds from southern Siberia to northeast China, Korea, and northern Japan, wintering to southern Japan, east and south China, and Vietnam. It is a rare vagrant to the Aleutian Islands and rarer still along the Pacific Coast of North America. Washington has three records, all from near coasts: January 1979 from the Naselle River (Pacific County), July 1993 at Sequim (Clallam County), and February–March 2002 at Samish Island (Skagit County). In British Columbia, a Falcated Duck returned to Tofino on Vancouver Island for three winters in a row, to 1996. Another bird has wintered at Coburg, Oregon, for four years through 2007.